Price includes postage within the U.K. Shipping to the U.S.A. add £20 Western Europe add £10. 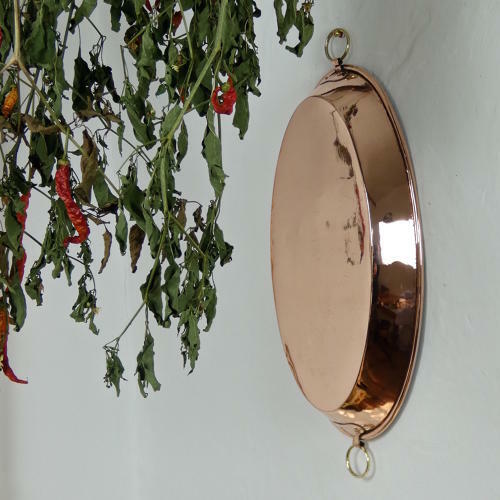 An antique, French copper, oval gratin dish dating from c.1890. This type of dish is ideal for transferring straight from the oven to the table. They are perfect for cooking something like dauphinoise potatoes or even a small fish. They can, of course, also be used on the top of the stove, as a saute pan. This one is made from quite a substantial gauge of copper and it has small, folding, brass loop handles so it can hang when not in use. It is in very good condition and we have had the interior re-tinned so that it can be used safely.